You'll be £12.00 closer to your next £10.00 credit when you purchase Panzer IV. What's this? The Panzer IV – Panzerkampfwagen IV – was one the foremost German fighting vehicles of the Second World War, and this volume in the TankCraft series is an ideal introduction to it. With detailed captions, text and illustrations the book tells the story of the technical development of the Panzer IV and the numerous variants that went into production, and it describes how it evolved from an infantry support vehicle to become the backbone of the Panzer units. It was modified and upgunned to face the ever-increasing enemy threat, and it proved to be so diverse and effective that it earned a unique tactical role on the battlefield. A large part of the book showcases available model kits and aftermarket products, complemented by a gallery of beautifully constructed and painted models in various scales. Technical details as well as modifications introduced during production and in the field are also examined in order to provide everything the modeller needs to recreate an accurate representation of the only Panzer that stayed in production throughout the war. A reference documentation for both the scale modeler and the professionals in charge of their reproductions in kits. Recommended for the World War II German armor fan, modler or not. Some very interesting insights to the history of the Panzer IV and its variants. Read the review in full, online here. ... A boon for the modeller and for those who, unlike me, can paint. I already wrote about one book in this series, Sherman Tanks (Tankcraft #2), and now have read a few more, both in paper and in eBook versions. The more I leaf through them, the more enthusiastic I get. These are real gems for both scale modelers and those of us interested in the technical aspects of these tanks. You will find this book full of of reference material that is undoubtedly primarily aimed at the military model maker, but will no doubt be of interest to those with an interest in the real thing given that there are many, many black and white archive images of the different Panzer IV tank variants along with some specialist Panzerjager and Flankpanzer variants. This popular series is aimed primarily at model makers and engineers but it contains first class illustration and a very effective text overview of the Panzer IV. This new book covers the tank model that became the backbone of Wehrmacht and Waffen-SS armoured divisions to the end of the war – Highly Recommended. 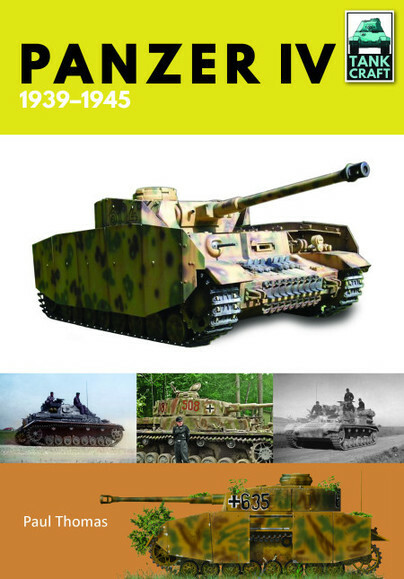 Each of the historical sections are well illustrated with archive photos, all well captioned, and provide some useful references for the modellers as well as the Panzer historian. Paul Thomas is a previously published author and collector of 2nd World War photographic images.